There are 190 plays currently running in Paris. That’s enough to discourage the weak in heart from even starting to thin out the herd. But if you’re a real fan of stage productions, you’re made of sterner stuff. So I put on my thinking cap and selected a few. And saw a few more through serendipity. First was Ionesco Suite at the Montmartre annex of the Théâtre de la Ville (de Paris), just down the street from me. That was one bit of serendipity, because when that troupe brought Ionesco’s Rhinocéros to Ann Arbor, in French, I interpreted for the workshops they held at University of Michigan. In return, they invited me to see this other Ionesco production of theirs when I returned to Paris. The actors were largely the same, but this “play” is actually a mélange of five Ionesco works: Jack or the Submission, Frenzy for Two, The Bald Soprano, Exercices de conversation et de diction, and The Lesson. The troupe has been together for almost a decade, and they’ve studied all of Ionesco. One day director Emmanuel Demarcy-Mota handed out ten of the playwright’s texts and told them to choose one that spoke to them and work on it. Then those texts were structured and woven together to turn the spotlight on explosive social situations such as weddings, family reunions, and birthdays. All this with minimal sets, multiple costumes, heavy make-up and a stage as close to theater-in-the-round as possible. The result is hilariously absurd... which is something Ionesco would approve of. Then another piece of serendipity: former neighbors from my old Montmartre apartment building turned up on my doorstep and invited me to dinner and a play. The dinner was at Brasserie Flo and the play was a bit of light fluff: Cher Trésor at the Théâtre des Nouveautés, in which veteran comic playwright Francis Véber, the Neil Simon of France, takes aim at the tax man. (It’s a subject prominent in French headlines right now as film and music stars flee to Belgium, Switzerland or Russia.) The title means “Dear Treasure”, as in Treasury, as in IRS. The hero, played by Gérard Jugnot, is a faceless loser who hasn’t had a job in years. He’s living at his godfather’s ritzy apartment and taking care of it in his benefactor’s absence. 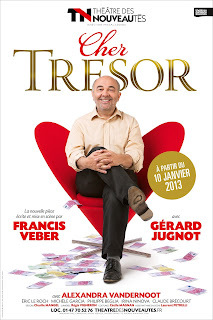 One day a tax auditor shows up looking for the owner and Jugnot (as François Pignon, the sad-sack character from Le Dîner des Cons - “The Dinner Game” in English) gets a bright idea. If he has a tax audit, people will think he has money and stop taking him for granted, women will desire him and he’ll be offered a job. At least that’s the plan. So he agrees to rat out his godfather in exchange for a pretend audit. And then it all goes to hell in a handbasket. The script is not only full of twists and turns, but manages to stick uncomfortably close to how internal revenue services think. Like I said, fluff, but well-written, ably-acted fluff. As the weather finally stopped being hostile and my stay in Paris was running out of time, I decided to take the bull by the horns and just show up at the theater to see if Comme s’il en pleuvait (It’s Raining Money) was indeed really sold out. With big-name stage and screen actors Pierre Arditi in the lead role of Bruno and Evelyne Buyle as his wife Laurence, tickets are scarce. But the French have something called strapontins, which are those folding seats you see on the Métro, but redesigned for a theater - here the prestigious Théâtre Edouard VII near the Opéra. Once you sit down, it’s quite comfortable, provided you don’t stand up and let it snap back into folded position, much like a switchblade. The play’s plot is an interesting one: money starts to appear in the apartment and Bruno and Laurence don’t know where it’s coming from or what to do about it. First only a 100-euro note, then 1420 euros... then too much to count. As Bruno and Laurence are Socialists of the gauche caviar variety (caviar Leftists), this poses certain existential problems. How they deal with those problems is the crux of the plot, focused tightly on them; there are only two other minor actors and just one set design (with excellent sight lines, I might add). Thanks to the bumbling, stammering character Arditi has perfected over the years, laughs are loud and frequent, but Véber seems to lose his way after making his point and the ending isn’t nearly as strong as the beginning and middle, although it is totally unexpected. My final bit of serendipity was on an entirely different level: an invitation to Nous n’irons pas ce soir au paradis (We Won’t Be Going to Paradise Tonight) at the Théâtre de la Ville. This is a one-man show by Serge Maggiani, who starred in that traveling version of Rhinocéros I mentioned above. 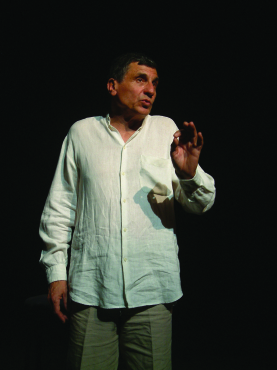 Serge skillfully presents Dante’s Divine Comedy in an hour-long show. His presentation falls somewhere between the griot perpetuating the culture-that-went-before and the college professor explaining the art of writing. Into all that, Maggiani tosses splashes of his own muted humor aimed at the absence of scenery and the need for imagination, speaking to the spectators in the familiar tu form reserved for friends in France. He sets the aura of Dante’s era with a phrase that struck me as very perceptive: En ce temps, le monde était le monde que Dieu rêvait (In those days, the world was the world as God dreamt it). Then, as both actor and author, Maggiani takes what he has picked as the “important bits” and personifies them, comments on them, examines them as if he were turning them over and over in his hands. Ultimately, he presents Dante as an adventurer, an inventor and a messenger. 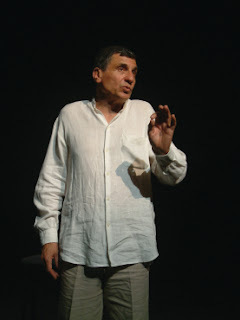 By the end of the performance, Serge had so well communicated the gist of what he feels is a seminal part of Dante’s Comedy that we could follow along as he recited an entire passage... in Italian. Which, although it is fairly similar to French, is still amazing. This is an evening for connoisseurs, but one honed to a relaxed sharpness. As time was winding down, there was one play I definitely didn’t want to miss. 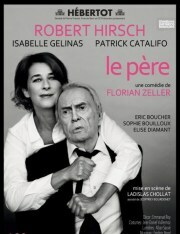 Luckily it’s been held over so I got a chance to see Robert Hirsch in Le Père at the Théâtre Hébertot. Hirsch is one of what the French call the monstres sacrés, the sacred giants. He’s nearing 90 now, and will surely keep acting until he drops dead in the wings, like Molière. (In fact, much of Hirsch’s career was at the House That Molière Built, the Comédie Française.) This play, by Florian Zeller and directed by Ladislas Chollat, has Hirsch, as the elderly André, moving in with his daughter Anne, played truthfully by Isabelle Gélinas. She loves her father... but it’s not easy to become the parent of our parents, or the child of our children. Gradually the light laughter of the opening scene turns dark as André slips deeper and deeper into the night. In addition to excellent acting, the casting is also remarkable, as there are multiple personalities for the three supporting roles and even I found myself confused at first. But the two ears and the tail just have to go to the designer, who came up with a brilliant set that transforms with every curtain rise (about 20 between each short scene). Each time the room is similar but not the same... and always a bit starker. Walls are no longer where they were, windows change, furniture appears and disappears, all combining to make the setting unfamiliar. If this is what growing old is like, I think I’ll get off before I reach that stop. And yet if Hirsch can flawlessly remember two hours of lines at his age, then maybe there’s hope for us all! It’s the coldest night of the year so far, but also my last free night in Paris. So I decide to catch one more play: La Folle de Chaillot (The Madwoman of Chaillot) by Jean Giraudoux at the Théâtre des Champs-Elysées. It was written in 1943 - during the Nazi Occupation - but only performed over a year later, when Paris had been free for only a few months and Giraudoux had died. Yet the play reads as if it were taken straight from today’s headlines. Why? Because the villains in this play are... oil executives. What could be more prophetic? Act One takes place in a café where the oil mogul and his investors plot to drill under the streets of Paris, which will require blowing up the city official who refused a drilling permit. Each of the executives is a self-made man, but none will have much to recommend them to St. Peter when they die. The other characters are simple folk - most of them street people - who stand out colorfully against the black-and-white dress and minds of the villains. The Madwoman is the most colorful of all (“Don Quixote in a skirt”, says director Didier Long), played forcefully by stage-and-screen star Anny Duperey. And she sets about foiling the corporate plot, with the help of her strange friends. Telling you any more would require a Spoiler’s Alert, so I’ll stop there. This was obviously a larger-budget production than any of the other plays I saw, if only to afford a cast of 18. The costumes were amazing, the sets as well - intricate and complex. A welcome but sometimes distracting touch was the talents of the Street People - the vital cameo roles. The deaf-mute wore those shoe-skates (in red, of course) to zip around the stage. And then there was the juggler who played in the background with a hoop and a huge white balloon, or juggled with those flimsy plastic bags from the supermarket. La Folle de Chaillot is a play that everyone interprets differently, but this one has much to recommend it. Still, you might want to read the play first, because Giraudoux packed a lot into the dialogue, and there’s plenty to digest in this poetic satire that is as pertinent today as it ever could have been when he wrote it. As I said in opening, Paris has 190 plays currently on stage. They run the entire gamut of size and genre, as do the theaters where they’re playing. There are plays to make you think and plays just to make you laugh, plays for children and even plays in different languages. Most have matinee performances on week-ends for those who are early to bed. So if you can’t find something to tickle your fancy here... well, you’re beyond hope. And definitely not very play-ful. P.S. In a film version of The Madwoman of Chaillot from 1969, Katharine Hepburn played Aurelia, the title role, with Danny Kaye as the Ragpicker and Yul Brynner as one of the bad guys. Cities are living things. Even a city as historically protected as Paris. Neighborhoods change. They lie dormant a while, living their humdrum neighborhood lives. And then one day they’re rehabilitated and transformed by new construction. Or else they’re “discovered”. And yuppified. As living things go, Montmartre has led several lives. Initially, it was a small rural hamlet nestled on top of a craggy hill far to the north of Paris (given the transportation of the times). Then it was a pre-industrial village, with dozens of windmills that ground into flour the wheat grown by farmers on the plains below, or sawed planks and crushed gypsum to build the blossoming capital that was expanding ever closer. As the 1800s became the 20th century, its squalid but cheap housing attracted penniless painters and poets and it became an artist’s colony. By the time I moved there in 1970, it had settled into being a blend of all of the above, except that neither of the two remaining windmills still crushed, sawed or ground. 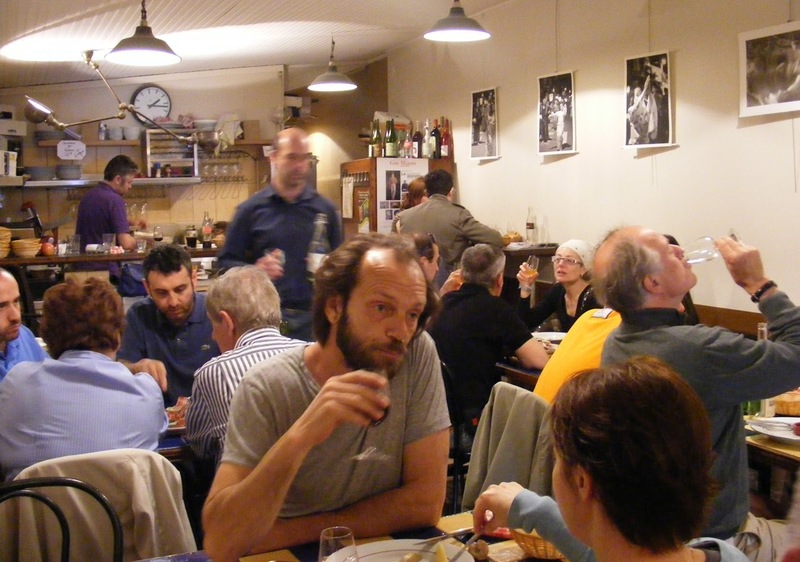 Plumbers and electricians, actors and artists lived side by side with the rest of us in a little microcosm of Life, all of us frequenting the same rosary of cafés and shops that stretched along the rue des Abbesses. And then Montmartre was discovered by the Beautiful People. But before that hurricane hit, a certain André Bourdin bought a shop on that street back in 1986, to add to the other one he already had in the suburbs. Bourdin was the grandson of a wine-grower in the Loire Valley, and so that’s what he chose to sell: wine. Time passed, the shop flourished and Bourdin Senior retired. The management of the enterprise (now totaling three shops) was handed over to son Emmanuel - or Manu, as he’s known to those of us who have seen his face achieve its first wrinkles over the years. And those hands have proven extremely competent, even though they were formally trained as a pastry chef before he moved on from dessert to beverages. Manu has added modern touches, such as a website where you can follow events held by the shop - mainly tastings but also an occasional raclette party or a wine trivia quiz - and check out featured items and end-of-rack sales. Physically, he’s changed little in the shop, except for the ceiling. If it ain’t broke, don’t fix it. And it’s definitely not broke. Business is brisk and smiles are always on hand, on the faces of customers and staff alike. One thing Manu has changed is the wine selection. He’s tweaked it to follow the changes in both clientele and tastes. “Wine has become something more cultural, a social occasion, rather than just having a drink,” he explained when I asked him about those changes. 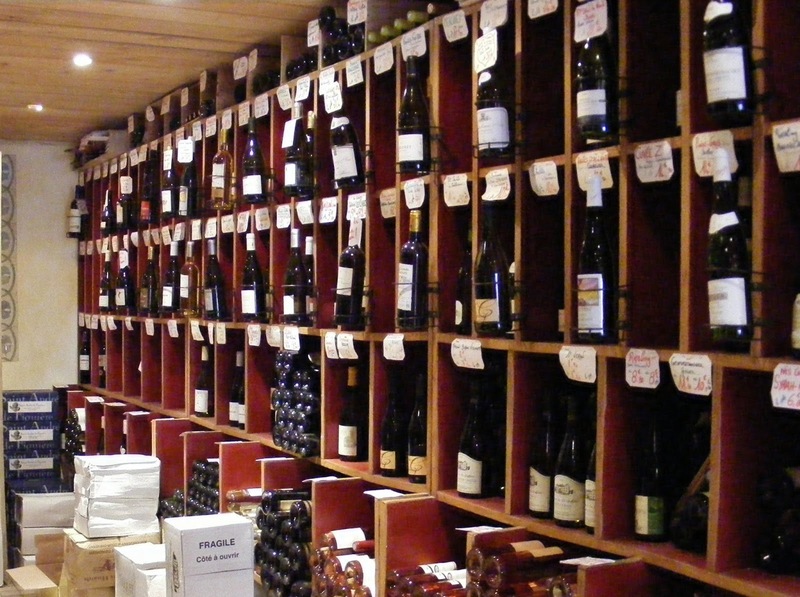 “We carry a broad selection of wines that offer good quality for the low prices we practice.” That selection includes 300+ different wines, ranging from 2.90€ for a simple table wine all the way up to (hold on to your hats) 1,100€ for a Lafite-Rothschild! 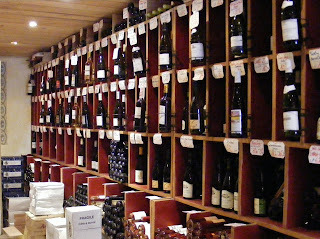 There’s also a back room to the wine shop. Once upon a time it was an actual forge that made metal objects. Which just demonstrates what Montmartre was not so very long ago and how it’s changed. A few years after the store opened, and before the yuppy invasion, Michel Desroches, a sommelier also from the Loire Valley, appeared and helped turn that forge into a tiny wine bar where The Usual Suspects could taste a selection of the wines sold in the front of the house and have something to nibble on to absorb it all. Michel has moved on, but his creation is still going strong. The tiny room is crowded and noisy during peak hours so I try to get there early. When the shop closes and the front door is locked, the wine bar is still rollicking and customers leave after last call (10:30), through a side door. Often singing. When I ask Manu what’s special about his wine bar, he says “It’s kind of hidden away... and we have a good mix of people.” Which is true. The Old Guard welcomes the Young Invaders and they all end up talking together, discussing politics, soccer... or else the newcomers never come back, which is just fine with everyone. It’s a real cross-section of society... and that’s a hard thing to find in today’s Montmartre. When I go with friends, we order the assiettes. There are five different sliced meats platters to choose from, another four with various assortments of cheeses and one with a variety of marinated antipasti: tomatoes, artichokes, eggplant and zucchini. If there are several of you, order one of each. Together they make quite a meal. And the list of wine by the glass (or bottle) includes 7 whites, 1 rosé and 13 reds. Room for dessert? How about a moelleux au chocolat (a lava cake, chocolate of course), obviously washed down with a glass of champagne. The sign over the front door announcing the half century of bons et loyaux services (dedicated service) of the very first shop in this family chain has just come down but the spirit is always festive in this most-genuine-remnant-of-the-old-Montmartre. Genuine to the tips of its fingernails - authentique jusqu’au bout des ongles. The Caves des Abbesses is the real deal. So even if you’re only passing through the neighborhood, and even if you’re “just” a tourist, try to drop by when the wine bar is open. You won’t regret it. P.S. If you buy too many bottles to carry home, they deliver on Saturdays. That’s definitely a plus if you live uphill. When you’re a student at the Sorbonne - the “real” one, the original - you become familiar with the Quartier Latin, the part of the city that dates waaay back to when Paris was Lutetia. It’s called “Latin” because Latin was spoken in the university, founded in 1257. But it could just as well be called “Latin” because when B.C. became A.D. the Romans ruled over France and this was the center of their activities. There are Roman ruins under Notre-Dame that were discovered while digging to build a banal underground parking lot. There’s an “arena” where 15,000 inhabitants of Lutetia used to watch plays but where children now play, students work on their tan and only a handful of summer events are held. And then there are the ruins of the Roman baths that are part of the Cluny Museum, just next door to the Sorbonne. 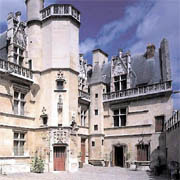 The Musée de Cluny is housed in the residence that the Benedictine monks of Cluny (Burgundy) built in the French capital in the late 15th century. As befits its birthdate, it specializes in medieval art. The artwork was collected over a lifetime by Alexandre de Sommerard, who lived in the residence at the end of his life and bequeathed his name to the entire street, short as it is. The residence became a museum in 1843 and is known for two things: those Roman baths and the Unicorn tapestries. Not much is left of the huge frigidarium, the only part of the baths still standing. It was burned down by the Huns in the 3rd century A.D., which makes the ruins a stark contrast with the 21st century traffic zipping by just a few feet away. During my university days, I seem to remember all of it being open to the sky, but now the vaulted ceiling has been restored and it's where the temporary exhibits are housed. Until March 4th, the ancient walls - which amazingly filter out the noise of traffic - serve as a backdrop for an exhibit of games down through the ages: “The art of games, from Babylon to Medieval Europe”. Some are familiar, such as the decks of tarot cards; others are the ancestors of chess, backgammon or cribbage. There are sets of dice from the days before the Roman Catholic Church banned gambling. And some pieces are on loan from the collections of the British Museum while others bear prestigious names, such as Charlemagne or Saint Louis (the French crusader king, not the American city). Next to the frigidarium is a room whose bare stone walls are the perfect setting for 21 mutilated heads of the Kings of Judah, sculpted around 1220 and decapitated when the mobs of the French Revolution descended on Notre-Dame. They were discovered by chance in 1977 during street repairs in the department store district. Along with other broken statues, they had been sold as rubble to a builder in 1796 and someone buried the heads out of respect. In spite of their wounds, they are still striking and regal. Nearby stands a 13th century statue of Adam, bigger than life and preserving his modesty with a fig leaf. The remaining 21 rooms offer a wealth of medieval artworks: religious pieces such as crosses, goblets and reliquaries but also the treasures of everyday life ranging from pottery to jewelry to armor. The highlight of the museum though is the series of six tapestries known as “The Lady and the Unicorn.” Late 15th century Flemish masterpieces intricately woven of wool and silk, they are the most perfect set that has come down to us. Each of the five senses is depicted. For Sight, the Lady holds a looking glass up to the Unicorn and for Taste she is choosing a piece of candy from a dish. Hearing shows her playing an organ and Touch has her caressing the Unicorn. Smell is a scene filled with flowers; it’s my favorite because of the little monkey who steals one flower from a basket. (He seems to be inordinately fond of flowers in these tapestries.) The monkey also is the key to which sense is being highlighted, in case you're overwhelmed by all the details. Across the room is the most fabulous tapestry of all: “My One and Only Desire” which, of course, is purity, or the pursuit of purity. In it, the Lady puts away her magnificent necklace, renouncing the pleasures and passions of the five senses depicted on the wall opposite. Although they have been hanging on the walls of Cluny since 1882, the tapestries now have been gathered together in their own circular room. The lighting is dim in order to preserve the five-century-old colors, but theatrical enough to bring out their vibrancy. Seating has been provided so you can gaze at them to your heart’s content, contemplating all their symbolism... the lion on the lady’s right representing the Sun and the real world, the unicorn on her left for the Moon and the mythical world, my little monkey for lust and malice, all standing out against a background of animals and mille-fleurs (thousand flowers) that must have ruined the eyes of many a Flemish weaver. The surrounding gardens are being restored and should be open when the weather stops being so strange. For the moment, you’re better off snug and warm inside the mansion of the Benedictine monks. They knew how to live. At least here in Paris. There is much ado made and hoohah raised about American products showing up on French supermarket shelves. David Lebovitz wrote a blog about it: 10 Goofy Foods You’ll Find in a French Supermarket. Among them were pop-open ready-to-bake crescent rolls, corn syrup, Lay’s flavored potato chips and Harry’s American Bread. Yup, tasteless sliced white bread in the country of the baguette. Mon Dieu! David’s right. There are more and more American “foods” appearing on French supermarket shelves... and unfortunately on people’s plates at home as well. And little of it is healthy or nutritious. Whether that - combined with McDonald’s and other fast food joints - have anything to do with the rising obesity rate among the French can be debated, as can global warming, but it’s pretty much a given. When I first arrived in Paris, I knew no one. Far from home, I was living out of a suitcase and out of a hotel room. I visited the U.S. Embassy to see if there were any jobs going or apartments listed. The answer was no to both. But I did make friends with the Marine guards, thanks largely to a mini-skirt and a fair set of legs. Not only did that lead to open invitations to their weekly Friday night dances, but also access to the Embassy’s PX. Some of the Marines would let me accompany them inside to buy things that my homesickness made me lust for. Can’t remember now what they possibly could have been, but peanut butter was probably on the list. Now, many years hence (or is it thence? ), I ask myself why, if you weren’t brought up on the stuff - American junk food, that is - why in the world would you find it desirable? And yet some of these alien culinary invaders are welcomed here in France, by the French, who have a reputation for being gourmets. Go figure. Another thing we bought at that store was corn flakes, which now you can find anywhere. Ah yes, and maple syrup. Let’s not forget that! What good are pancakes, or indeed crêpes, without maple syrup? A third thing in the caddy was typical North American honey. Very different from the myriad kinds of honey you find here, which are all delicious but (to the trained American palate) just don’t taste right on a slice of toast in the morning, even if it is baguette. Pancake mix? In the land of the crêpe? My daughter on the other side of the Atlantic just reminded me that we also bought Oreos and Animal Crackers and jello. I believe her even though I’ve always found jello pretty foul. (Sorry, Mr. Cosby.) But I guess I felt I couldn’t bring up American children, even abroad, without subjecting them to that rite of passage. On a more gastronomic American food level, special hurdles arose around the end of November. One big problem was finding a turkey for Thanksgiving dinner. Not that France doesn’t have turkeys; they were transplanted here in the days when France had colonies in the New World. No, the turkey problem was finding one ready for the oven in November because French poultry breeders only sold them for Christmas dinner, which is one month too late. The names of butchers who would stock turkeys at Thanksgiving time was a piece of information that was whispered from Yankee ear to Yankee ear faster than the Concorde could fly (which, FYI, was twice the speed of sound). Cranberries were another Thanksgiving problem. Fresh ones are still rare today, and the French equivalent - airelles - are much smaller and more tart so they’re no good for making cranberry sauce to go with the turkey. However, you can now buy cranberry juice in just about any supermarket, even the small ones... and yes, it’s Ocean Spray. Corn, O.K. But artichoke hearts? Imported? Corn was another headache. To the French of that era, liking corn was totally perplexing because they felt it was only good for feeding livestock, as any Frenchman would tell you if the topic arose. Occasionally you could find it in a can, but only at high-end shops like Fauchon, where the cost of one can would set your child’s college fund back several months. As for corn on the actual cob, there was none... and what there is even now isn’t worth the water to boil it in. Just as France is being invaded by American products, the reverse could be said about America, I guess. Or at least about places like locavore Ann Arbor, which is big into slow food and organic and free-range. It’s become fairly easy there to find crème fraîche, which is a good thing because so many good French recipes call for it. 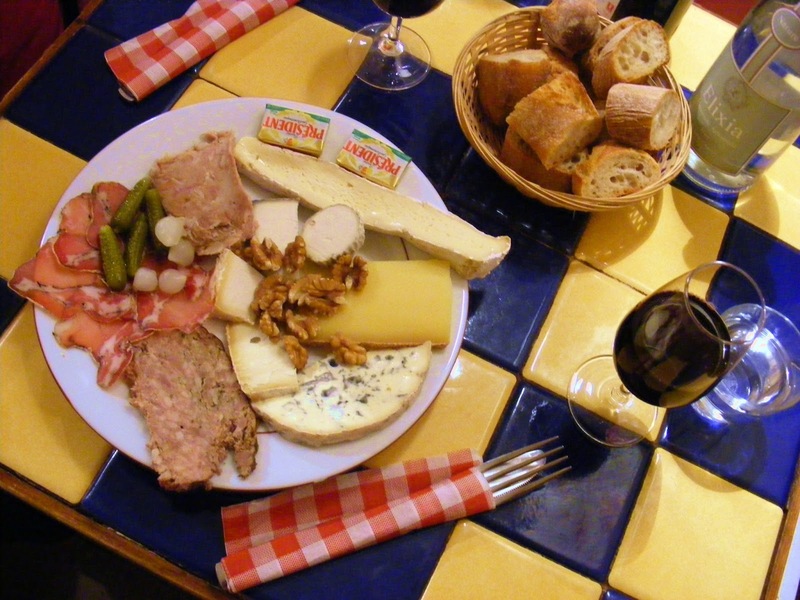 And there are several places around town that sell French cheeses and wines, although many offer the same three over and over. There’s even a Japanese lady who learned how to bake a mean baguette while living in Paris, and she’s gone into that business in Ann Arbor. But the problem facing both France and America is the downward spiral of quality. The Cartesian conclusion to draw is that companies are dragging quality down to make more money, and that it’s happening on both sides of the Atlantic, albeit a bit later in Europe. Fresh produce and meats still have more taste here. But any processed food is becoming an ever-growing disaster. Just this week it was discovered that there was horse meat in the ground beef used in frozen burgers and prepared dishes such as lasagna or shepherd’s pie. In spite of what was written on the label and in defiance of strict EU law. So my advice is: keep reading the packaging. Or better yet, cook your own dishes, from scratch. Invite your friends over. Maybe open a bottle of French wine. And enjoy their company. That is still very French. David’s blog can be found at www.davidlebovitz.com. I don’t agree with everything he writes, but it’s almost always well-written and usually interesting. my neighborhood store sells these "authentic American roasters"
N.B. and Full Disclosure: All these photos were taken in my G20 mini-supermarket in the rue Lepic. It isn’t big enough to offer more American products, which makes it a perfect example of what you can find just about anywhere now. Please excuse the blurriness of some photos; the staff was restocking the shelves and was looking at me askance, so I was a bit rushed. Paris is built on a river. But most of you know that. Maybe you've even taken a bâteau-mouche cruise along the banks of Seine. If you have, you will have seen this statue. It’s a survivor from a previous bridge, one which proved too narrow for modern traffic and also was starting to sink a bit, which can’t be good if you’re a bridge. (The French use the word “tassement”, which is what people do when they grow older... and subsequently shorter.) So from 1970 to 1974 the old bridge was taken down and a new one put up. There’s one major difference between the two bridges though. The old classic one had two piers, and there was a statue on both sides of both piers, for a total of four. The new resolutely modern bridge has only one pier (on the Right Bank) and so it was decided not to put the statues back up. Except for the zouave. Because the people of Paris, and the Port Authorities as well, use him to measure the height of the Seine. 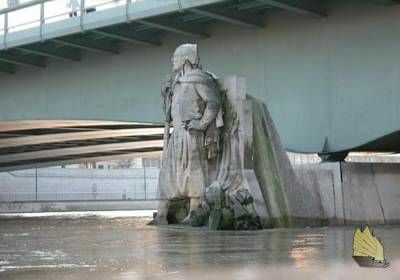 When the zouave soaks his weary feet in the water, the Seine is officially in flood status and the expressways along the river are closed to traffic*. That happens several times a year, especially in the spring when April showers bring May flowers and snow in the mountains far upstream melts. When the water gets up to the zouave’s thighs, the river is no longer navigable because boats can’t pass under the bridges of Paris. 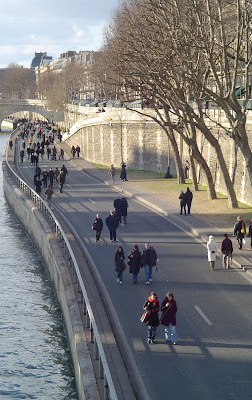 Working backwards, in the winter of 1999-2000, the Seine came up to the brave old soldier’s knees. In 1982, it came up to his... er... family jewels (otherwise known as Big Jacques and the Twins). In 1955 up to his waist, and even a bit higher back in 1924. But the apotheosis was in 1910, when it came up to his shoulders... and spilled over the banks, covering most of central Paris. Twenty thousand buildings were flooded and half of the subway system lay underwater. Plus this disaster struck on January 28th, so the water was ice cold. And to add insult to injury, the sewer system backed up and epidemics of typhoid and scarlet fever broke out. It took until mid-March for the flooding to be entirely gone. Add to this the fact that when the new Alma bridge was built and the statue put back in place in 1974, the zouave was mounted higher up than before, so even more attention is now paid when parts of him disappear underwater. But what is a zouave? It’s the term for a French soldier from the North African infantry, one of France’s most decorated regiments. These troops fought especially valiantly in the Crimean War, and specifically at the Battle of the Alma River near Sebastopol in 1854, which is the year this bridge was built. The zouave depicted on the bridge in Paris is wearing the traditional uniform: a fez, a wide sash, waistcoat and jacket, and the especially distinctive “puffy pants”. He stands with left hand sassily on hip and the other holding his rifle at the ready. A tall man of 5.2 m (17 ft), he’s a bit hefty, weighing in at 8 tonnes (17,637 lbs). Right now the zouave’s feet must be aching because he’s soaking them. And it continues to rain daily over Paris and snow is falling upstream. So there’s little chance of the river level dropping any time in the foreseeable future. While 1910-like flooding will probably never be seen again, largely thanks to retention dams upstream, traffic within Paris has become problematic at best, with the riverside expressways closed. And the captains of tourist cruise boats are holding their breath, as are the captains of all those barges that carry goods back and forth under the bridges of Paris. Their swear words may soon be joining those of frustrated motorists. Meanwhile, the zouave with the wet feet just stares off into the distance, listening for cannon fire. 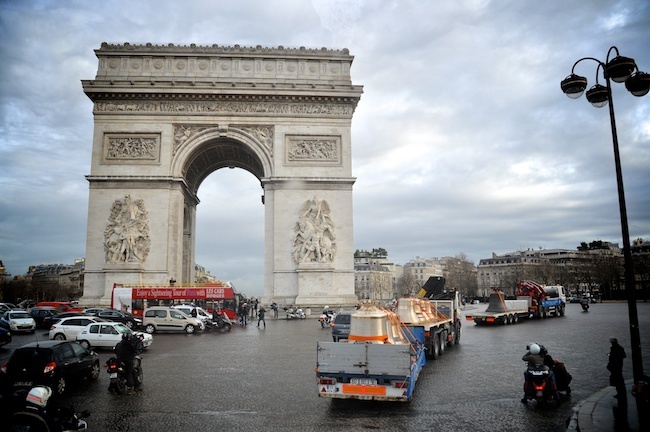 *The present mayor of Paris, Bertrand Delanoë, has made great changes in these expressways. For many years now, they’ve been closed to traffic every Sunday from 9 am to 5 pm so that people can take romantic walks along the riverside. (They still have to keep a careful eye out though for speeding rollerbladers or bikers in training.) 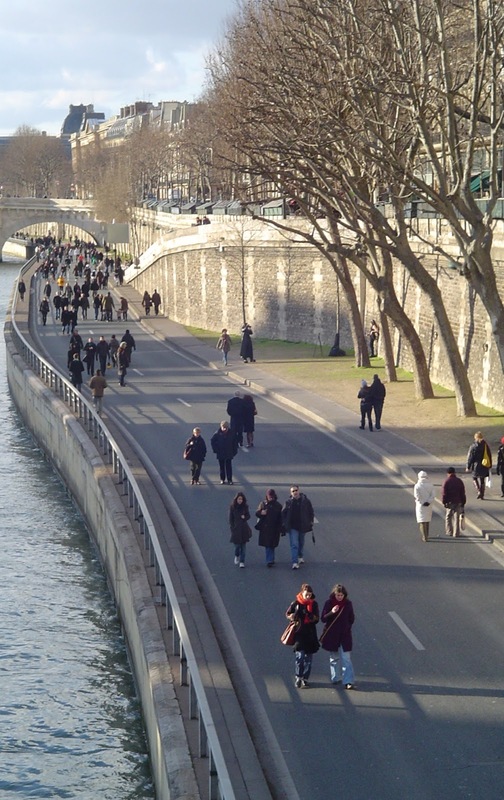 In addition, sections on both banks have been reconfigured to cater less to cars and more to the bipeds of Paris. One section has already been implemented on the Right Bank, from City Hall to past the Ile St. Louis. Another is slated to open in the spring of this year, running from the Orsay Museum almost to the Eiffel Tower on the Left Bank. This is the same mayor who brought the Vélib low-cost rental bike system to Paris and has created more and more dedicated bus lanes at the expense of car lanes, so he is already hated by motorists. He obviously believes the French capital should be pedestrian-friendly. Notre-Dame de Paris is having a birthday. The venerable lady is 850 years old. I can’t tell you her exact birthday because we don’t know when to count from. There aren’t any records that say what day construction began. So we have to work from the year. The first stone was laid sometime in 1163. And work continued until 1345. That’s a lot of years. A lot of years, ten French kings and 18 bishops of Paris! Pretty impressive. Which is what Our Lady of Paris is. Impressive. During the Revolution, citizens thirsting for the blood of the monarchy swarmed over the facade, crying “No more kings”, and decapitated every single statue. They didn’t realize what Kings of Judah actually meant... and I doubt they cared. Fifty years later, the neglected cathedral was crumbling away, with pieces falling from its towers into the streets below. It was slated for demolition. But Victor Hugo took pity on it and in 1831 wrote The Hunchback of Notre-Dame, dedicating all the money he made - and probably more - to its restoration, which took 23 years (including replacing the severed heads). That novel, and the zeal of Hugo, saved the cathedral. Without him, without Quasimodo and Esmeralda, Notre-Dame would be gone. Yet shortly after that, all of Hugo’s efforts almost went up in smoke. Once again, frenzied citizens of the poorest sort took to the streets, declaring the Commune of 1871. As they were being beaten back by government troops, they set fire to the Louvre, Palais-Royal, City Hall, and many other buildings. Notre-Dame was on the list but escaped. With the advent of the motor car came a different kind of danger: exhaust fumes. When I visited Paris with my parents in 1958, the cathedral was filthy black, as were all the monuments. And it was still black when I moved here ten years later. Then André Malraux, noted author and Minister of Culture at that time, decided to wash away the centuries. Sandblasting immediately proved destructive to the statues, so the job was finished with soap and brushes, sometimes even toothbrushes to clean the minutiae. 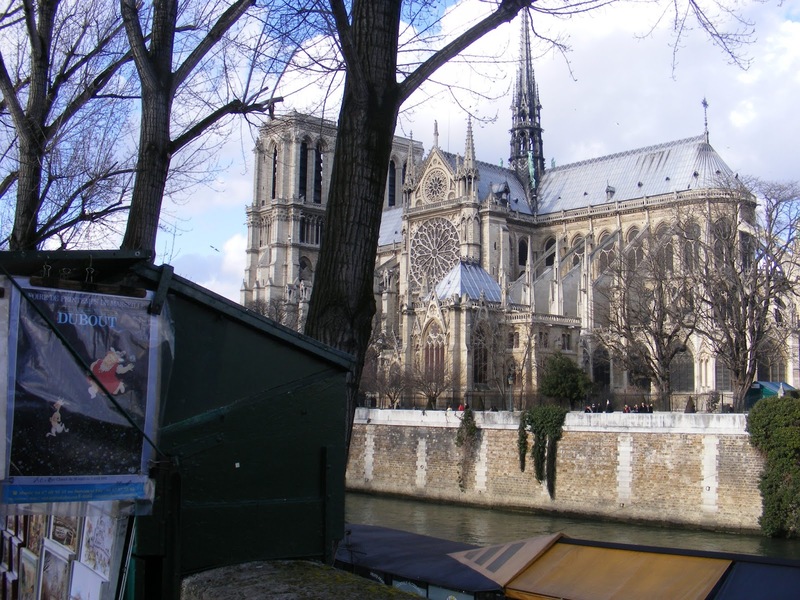 Yet today, in spite of all those close calls, Notre-Dame is having an 850th birthday. So what do you buy the cathedral that has everything? Well, how about some new bronze bells? Remember the scene in The Hunchback when Anthony Quinn, in the title role, jumps onto the big bell - the bourdon (bumblebee) - and rocks back and forth until it starts ringing louder and louder? I’ve been up in those towers several times, luckily never on the hour. It’s loud enough when you hear the ringing from ground level! Quinn’s bourdon, whose name is Emmanuel, weighs in at almost 13 metric tonnes (28,000 pounds) and was cast in 1685, when it replaced Jacqueline, cast in 1400. These bells live long lives. 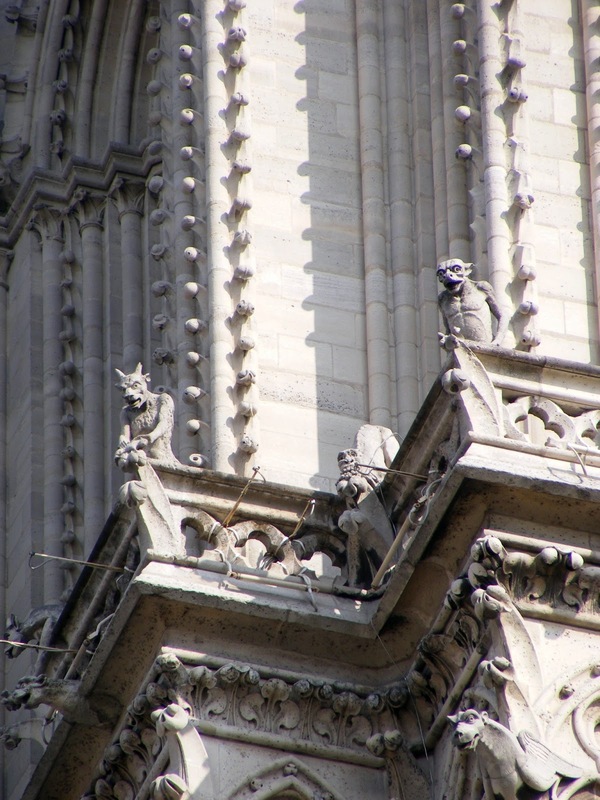 Emmanuel was taken down from the South Tower during the Revolution, but Bonaparte had it hung back up a few years later. The other bells, all hanging in the North Tower, were removed and melted down, some say to make cannons. In 1856, Emperor Napoleon III had four new bells hung in their place, but they were of inferior quality and gradually went out of tune. Of course, they had rung every 15 minutes without fail since then... as well as ringing loud and long to celebrate the end of World War I and the liberation of Paris in 1944. Most recently, in an act of transatlantic empathy, they chimed in honor of the victims of 9/11. After a long career, they were finally taken down in February of 2012 and the skies of Paris have been abnormally quiet ever since. Like the bells before them, they’ll be melted down, but hopefully not for cannons this time. Emmanuel rings out a pure F#, and its new neighbors have been tuned to that note. A new, smaller bourdon will share the South Tower with Emmanuel. Its name is Marie, which was the name of the cathedral’s very first bourdon in 1378. Marie was cast by the Royal Eijsbouts foundry in Holland and then shipped to Normandy to join the others. The eight new French-made bells were cast by Cornille-Havard in Villedieu-les-Poêles, a foundry in Normandy which has existed since the end of the Middle Ages. This is a town I know well because it’s on the road to Mont Saint Michel. It owes its name (which vaguely translates to The City of God’s Frying Pans) to two things. The first part, Villedieu, is the name of the land granted in the 12th century by Henry I, King of England and Duke of Normandy, to the religious order called the Knights Hospitaller, who later became the Knights of Malta. The second part - les Poêles (frying pans) - refers to the business of the town: coppersmithing. Advanced coppersmith technology was probably imported from the Middle East by those Crusader monks. By the early 14th century, the Corporation of the Coppersmiths of Villedieu had been officially recognized by the Kings of France and ever since the town has been known for its mastery in everything from pots and pans to... well, to church bells. All together, the nine new bells weigh 23 tons. And their total cost came to 2 million euros ($2.7 M), all in donations. The completed project is a return to the original design: eight bells in the North Tower and two bourdons in the South, with Emmanuel as the base note for their tuning. On the last day of January, with a crowd looking on and cheering, the head of the foundry in Normandy rang the bells and they were blessed. 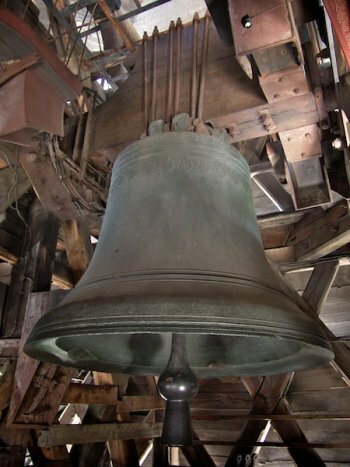 Then all nine new bells left Villedieu on a convoy of trucks that would travel to Paris at a speed not to exceed 50 mph (80 km/hr) under any circumstances. 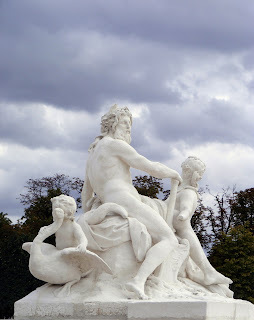 Two days later, they rolled majestically down the Champs-Elysées and along the Seine River to Notre-Dame, their new home. After being blessed again on Candlemas, in thanks for a safe journey, they now stand proudly inside the Cathedral and will be hung in the towers on February 25th, the day I fly out of Paris unfortunately because I'd love to see that! When they ring out for the first time on Palm Sunday, all nine in tune, the silent skies of Paris will become raucously happy. And I’m sure Quasimodo will be smiling as well, wherever he is. The bell you hear as of Minute 3 or so is Emmanuel welcoming his new family. What you hear after Minute 12 is a reconstitution of what the bells sounded like at the end of the 17th century and what they will sound like again as of Palm Sunday 2013. Anne-Geneviève - in honor of both Saint Anne, Mary’s mother, and Saint Genevieve, patron saint of Paris. Denis - in honor of Saint Dennis, first bishop of Paris, patron of the diocese, who was beheaded by the Romans in Montmartre around 250 A.D.
Marcel - in honor of Saint Marcel, ninth bishop of Paris in the late 4th century.• Étienne - in honor of Saint Stephen, Christianity’s first martyr, and also the name of the basilica built in 690 on the site where Notre-Dame now stands. Benoît-Joseph - in honor of Pope Benedict XVI aka Joseph Ratzinger, pope since 2005. Maurice - in memory of Maurice de Sully, 72nd bishop of Paris (1160-1196), the man who masterminded the construction of the present cathedral in 1163. Jean-Marie - in memory of the beloved Cardinal Jean-Marie Lustiger, 139th bishop of Paris (1981-2005), born Aaron Lustiger into an Ashkenazi Jewish family but who converted at age 13 and whose mother was deported and died at Auschwitz. N.B. In a spirit of full disclosure, all the photos are mine except for the one of Emmanuel in his tower and the one of the bells arriving in Paris, near the Arc de Triomphe. UPDATE: I dropped by Notre-Dame on my way to Shakespeare & Co. this morning. In spite of the attack by the bare-breasted women protesting with "Game Over, Pope" and other things written across their torsos, the bells are still there. And even more accessible than when I did this article. Curious about how they're going to be raised into the towers, and being in the plane headed State-side when the hoisting is scheduled, I asked the Cathedral's staff. It turns out they will be lifted up by pulleys from inside the church and through a round trapdoor that you can see in the photo I took this morning. This is for the 8 smaller bells; there's a bigger trap underneath the South Tower for the bourdon, which will require even more horsepower. I so wish I could see this, but hopefully it'll be in internet. Years later I moved to France. And learned that you could find crêpes at sidewalk stands all across the country. Their aroma and warmth were welcome in the cold grey drizzle of a Paris winter. And eating one was always a treat for my children on the way home from school. If you travel to some parts of France, crêpes are a way of life. 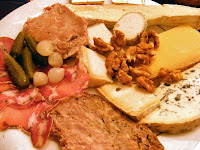 Especially in Brittany, a poor province where they historically afforded a way of keeping hunger from your door. Crêpes are so much a part of France that they have been given their own day: February 2nd. That day is called La Chandeleur, aka La Fête des Chandelles - The Festival of Candles. If I were to be doctrinal, I’d tell you that it coincides with the Catholic celebration of the day baby Jesus was presented to the rabbis at the Temple and Mary was said to have been purified after childbirth. Or I’d say that the Romans had a similar festival, the Festa Candelarum, where candles personified purification. But perhaps because I’ve read too many Astérix books, I’d rather link it to the Celtic festival in honor of their goddess Brigit. It celebrated purification and fertility as winter neared its end, with peasants carrying torches across their fields, asking Brigit to purify the land before they set about their spring sowing. The idea of purification runs through all these versions of La Chandeleur, but the Celtic ceremony was held on February 1st, which fits better, calendar-wise. Besides... Astérix, remember? Serving up crêpes for those who don't want to "flip their own"
Across the Pond in America, February 2nd is also a celebration: Groundhog Day. Punxsutawney Phil, of Punxsutawney, Pennsylvania, comes out of hibernation to take a look around. Being of a nervous nature, if he sees his shadow, he disappears back into his burrow and another six weeks of wintery weather are said to be in store. Well, I just learned Phil has a link to La Chandeleur, and it has to do with old French proverbs. One difference: the French replaced Phil with a bear. "Si fait beau et luit au Chandelours, six semaines se cache l'ours." (If it’s sunny on the Feast of Candles, the bear will hide for six more weeks). An exact parallel, except for the animal of choice. I guess they had a shortage of groundhogs, whereas bears were far more widespread in the old days; now France has had to reintroduce them from Slovenia, and shepherds in the Pyrenees are not amused... but that’s another story. You may wonder why crêpes are the food-of-the-day for this feast? Easy. They’re round and golden (if properly cooked). A perfect symbol for the sun. And here we obviously are doubling back to the Celtic feast, with its emphasis on future harvests. That requires sun. And there’s bloody little of it around in most of France in February, I can tell you! So crêpes it is. Now how do you make them? But if you want, you can make the crêpe batter up to two hours in advance and then cook the crêpes when your guests arrive. Or you can cook a stack of them and keep them warm in the oven. Dress them up with your favorite topping, flame them with a liqueur, or add dollops of whipped or ice cream and a shower of sliced almonds. This recipe calls for rum but you can use anisette (anise flavoring), Cointreau, vanilla extract or any other liqueur or flavoring you like. Plus citrus zest to give it some zing. - Heat the milk to a boil. Take the milk off the burner and add the butter so it melts. Stir and leave it to cool. - Slowly stir in the cooled milk. The batter should have no lumps, or else you need to strain them out. - Pour a small ladle-ful of batter into a hot, well-greased crêpe or omelet pan, tilting the pan in a circle until just the bottom is thinly covered. Remember: these are not pancakes. The crêpe should look almost like lace. - When the edges start to brown, which will be almost immediately, run a spatula knife under the crêpe, from the sides in, to make sure it doesn’t stick. - Toss the crêpe to flip it and let it finish browning. Or flip it with the spatula knife. - Don’t cook the crêpes too much. They should be golden, like the sun that they once represented at this half-way point of winter. Most French crêpes are served with just a smear of butter and a sprinkle of sugar, or with jam - usually strawberry or apricot - but sometimes with chocolate or hazelnut spread or crème de marrons (a sweet chestnut spread). You’ll notice I haven’t mentioned anything salty. That’s because these are dessert crêpes. Savory ones are called galettes and are made with buckwheat flour and obviously have no sugar, rum or other flavorings. Most often they are served with minced ham, sautéed mushrooms, grated Swiss cheese - or all three - on top. Sometimes an egg is cracked on the flipped galette and left to cook sunnyside up. One last detail: crêpe-flipping. Tradition has it that the first crêpe should be flipped with the right hand while holding a coin in the left hand. (All this is provided you’re right-handed; but of course everyone knows that left-handed people are the Devil’s Spawn anyway.) Ideally, the coin should be a gold louis d’or, but you won’t have one unless you’re a coin collector because they were last minted in 1789, pre-Revolution. Some people cheat and use a gold Napoléon but they were last minted in 1914, so... If you don’t have a louis or a Napoléon, use the highest denomination coin you have. The object is to flip the crêpe perfectly, landing it in the skillet (as opposed to on the floor) and not folded over on itself. If you can manage such a perfect three-point landing, you’ll have money all year long. And should you be over-enthusiastic and toss your crêpe too high, don’t worry if it sticks to the ceiling or the cupboards when you flip it. In the old days, the French said that if it was still stuck there in the autumn, you’d have a good harvest. In some regions, the first successfully-flipped crêpe was then wrapped around the gold coin and placed on top of the wardrobe in the master bedroom, probably to remind the Fates to be kind to you. The crumbs of last year’s crêpe - if the mice left any - were gathered up and the coin was given to the first poor person who crossed your path. So Happy Chandeleur. May your groundhog (or your bear) not see its shadow, may your crêpes be lacy and delicious, and may they flip with grace and land flat in your pan.